Local 10 of the International Longshore and Warehouse Union in San Francisco is holding a public event to honor Howard Keylor. A veteran of the Battle of Okinawa, Howard opposed the atomic bombing of Japan, an experience that led him to become anti-militarist, anti-racist and anti-imperialist. He quit college to support Filipino farm workers in the 1948 asparagus strike and became a labor activist during the McCarthy period, joining the longshore union in Stockton in 1953. During his decades on the waterfront, he initiated, organized and participated in many picket lines and demonstrations, including the longshore strike of 1971-1972, the ILWU’s 1974 KNC Warehouse strike of Mexican American workers in Union City, the historic 11-day 1984 boycott of South African cargo to protest Apartheid in 1984, the 1999 coastwide shutdown and march of 25,000 in San Francisco to demand freedom for Mumia Abu-Jamal, the United States’ most prominent political prisoner, the May Day 2008 anti-imperialist war shutdown of all West Coast ports, the blockades of Israeli ships to protest the war on Gaza, the 2011 ILWU struggle against the grain monopolies in Longview, Occupy Oakland’s march of 40,000 to the port, Local 10’s actions against racist police murders and fascist terror last year, and countless other militant job actions and protests. Howard Keylor is a veteran of the militant labor history of the Bay Area. Like the core founders of the ILWU, he seeks to replace capitalism with socialism, a commitment which he has maintained all his life. He continues to approach every issue from this perspective. An army veteran of the Pacific Theater in World War Two, Brother Keylor became a longshore worker in Stockton in 1953 and later transferred to the San Francisco local. In 1971 he, along with Brothers Herb Mills and Leo Robinson, and a majority of the Local 10 membership opposed the proposed 1971 contract which codified the 9.43 steadyman system. This led to the longshore strike of 1971-1972, which shut down 56 West Coast ports and lasted 130 days. It was the longest strike in the ILWU’s history. Like the founders of the ILWU, Brother Keylor seeks to replace capitalism with socialism, a commitment he has maintained all his life. He continues to approach every issue from this perspective. He served on the Local 10 Executive Board and was frequently an elected Caucus and Convention delegate. Brother Keylor was a member of the Militant Caucus, a class struggle rank-and-file ILWU group which published a regular newsletter, the “Longshore Militant”. He later split from the Militant Caucus and published a separate newsletter on his own, the “Militant Longshoreman”. Both called for breaking with the Democratic and Republican Parties, and building a Worker’s Party to Fight for a Worker’s Government. Brother Keylor has always worked to extend Local 10’s solidarity to other unions and locals. In 1974, he supported the ILWU Local 6 strike at KNC Glass in Union City in which a mass picket line defeated the police and scabs, resulting in a contract for a workforce composed primarily of Mexican-American immigrants. Keylor advocates deliberate defiance of the “slave-labor” Taft-Hartley law through illegal secondary boycotts and pickets by workers. He worked tirelessly to uphold the ILWU’s proud tradition of militant unionism by participating in protests and boycotts of military cargo bound for the military dictatorship in Chile in 1975 and 1978 and again in 1980 to the military dictatorship in El Salvador. In 1984, Brother Keylor made the motion, amended by Brother Leo Robinson, which led to the eleven-day longshore boycott of South African cargo on the Nedlloyd Kimberley; and in 1986 he supported the Campaign Against Apartheid’s community picket line against the Nedlloyd Kemba. When Nelson Mandela spoke at the Oakland Coliseum in 1990 after his release from prison, he credited Local 10’s actions with re-igniting the anti-Apartheid movement here. He also supported the 1974 and 2010 ILWU Boron miners’ strikes and the 1987 Inlandboatmen’s Union strike shutting down the Bay Area ports and mobilizing boatmen and longshoremen to march onto the Redwood City docks to drive out the scabs from other unions. Even after he retired from active longshore work in 1988, Brother Keylor continued his activism on behalf of the working class and the oppressed. In 1999, he helped organize the coastwide shutdown in defense of Mumia Abu-Jamal, the United States’ foremost political prisoner. 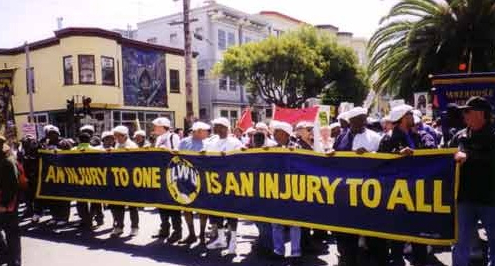 ILWU Local 10 workers and the drill team led 25,000 people on a march through the streets of San Francisco. Later in the year he marched with the Local 10 contingent in the Battle of Seattle, the mass protests against the World Trade Organization (WTO). Throughout his life, Brother Keylor extended solidarity where it was needed, including taking action against racist police murders and fascist terror, defending abortion clinics, and supporting survivors of psychiatric abuse. He witnessed psychiatric torture while working at the notorious Stockton State Hospital in 1949-51. He also witnessed members of his family become victims of electroshock and forced drugging. Having grown up in Appalachia, he has always been an environmentalist, and in recent years helped shut down a Monsanto facility in Davis in 2012, as well as fighting pesticide use and deforestation in the East Bay. 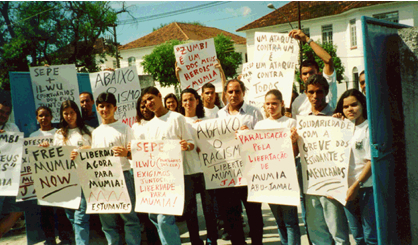 Brother Keylor used his experience and insights to help organize picketing and marches during the PMA lockout in 2002; and in 2010 and 2014, to protest Israel’s massacre of Palestinians in Gaza, he used his experience to help organize successful pickets against Israeli ZIM Lines container ships. In 2015, as he was approaching 90, he took part in Local 10’s protest at the APL terminal and later in downtown Oakland to protest racist police killings; and in August 2017 he supported Local 10’s anti-fascist action in San Francisco. The following day he participated in the anti-fascist demonstration in Berkeley. Brother Keylor had done this before: in 1980, the Militant Caucus called for a mass mobilization to stop the American Nazi Party from holding a rally at San Francisco Civic Center. Like Local 10’s call in 2017, the mobilization in 1980 succeeded in stopping the fascists. This entry was posted in Forums and Educational Events, Labor for Mumia, Recent News on December 3, 2018 by admin.